Thanks to my daughter Rebekah for finding this book. It was reprinted by Forgotten Books in 2012 though it was copyrighted by The Sunday School Times Company in 1906. I have always loved the history of Moody and Sankey and their blessed ministry both in this country and the United Kingdom. On our travels to Edinburgh, Scotland we visit the place where Moody preached and Sankey sang (composing The Ninety and Nine as he sang it). Sankey outlived Moody by a number of years, singing both at his funeral and also at Spurgeon’s funeral. The second half of the book is a series of hymn stories. Especially interesting are those where Sankey had a personal influence. That part makes a great resource for congregational singing. 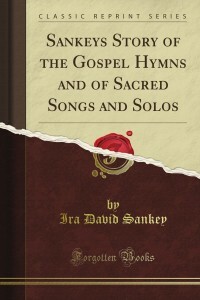 The title of this book contains his original title for that collection (“The Story of the Gospel Hymns”) as well as the title to the song book (“Sacred Songs and Solos”) which he and Moody used in their meetings.